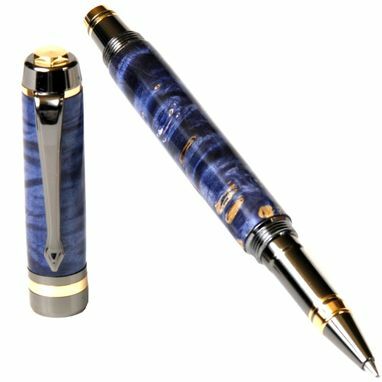 This "Elite" Metal body Schmidt 5888 Safety Ceramic Tip Roller Ball pen has a nice balanced style and design, Gunmetal Plated extension and features a cap that screws on to both front and back ends and a body made out of Blue Box Elder. Excellent product. Pens are super high quality and nicely balanced. The engraving on the boxes and pens was a nice touch and done well. Jim was easy to contact and helpful through emails. Products shipped on time, but arrived a few days after desired date. CustomMade website is difficult to use and confusing in places. Create's "projects" which is an annoying way to create your order. Web ordering could be streamlined.